Look closely on your chart and you may see “obstns” but the true horror is revealed by this photo from Benfleet Yacht Club’s website. Have you ever cut in between the Grain Hard Buoy and the Grain Fort, in order to cheat the outgoing tide, or to keep out of the shipping channel? Please let us know what you think or if you have had a close encounter. Afterthought: Is it just me or does it look like a fossilised grand piano? Max Taylor, Deputy Harbour Master, informs us that during September Peel Ports will be commencing their first campaign of buoy changes. In the region of 15 navigation buoys will be changed and river users will note a “new shade” of green for starboard lateral marks and a larger top mark for both of the lateral marks. More importantly the cardinal marks will be slightly different, the “body” of the buoy is painted grey, then there is equidistant black/yellow banding to denote the type of cardinal followed by the traditional “shaped” topmark. Light characeristics will remain the same and Notices to Mariners will be issued prior to the work being done. A dinghy has disappeared from the Hoo Ness YC tender compound adjacent to Wilsonian SC sometime since mid July. It is quite distinctive, being 6 ft long, 3 ft wide and blue – inside and out. The two oars are not a pair, one has a partially broken paddle and both have patches of blue paint. The ring for the painter in the bow has pulled out, so the painter passes through the hole where the ring was and is secured to the thwart with a bowline. There is a wooden ply patch about 1 ft square in the stern seat. If you have any information please contact webmaster@msba.org.uk. The KFB is scheduled for closures for various periods on 18-21 August. For details see www.eastcoastpilot.com. Also the Havengore Bridge is currently closed until further notice. UPDATE: Following last weekend’s storm, “Wavelength” drifted over from Segas SC. 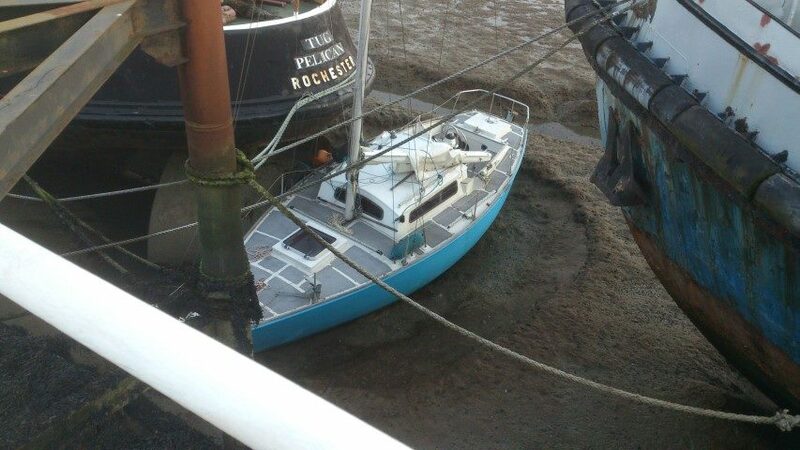 We understand the owner has been contacted and the boat has now been moved to a secure part of Port Werburgh. Apparently the boat received only minor damage. Have you seen this stolen Sea-Doo from Sandwich? A BBC Radio Kent reporter took a rigid inflatable boat across to a beach near Calais and back across the Channel without being challenged by either French or British police and border agencies. MSBA Vice Chair Cllr Kelly Tolhurst, when interviewed on today’s Breakfast programme (just after 2:01:00), warned that yachtsmen should beware of stowaways and drug smugglers. Two of the three sections of the long awaited pontoon are in Dover having new towing brackets and bridles fitted. They should be delivered next week, weather permitting!